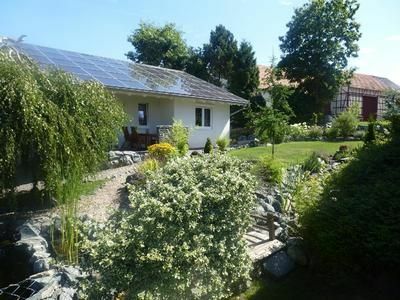 A beautiful property with 2 independent holiday homes (Edergarten 1 and Edergarten 2); separated by an economic chamber. Both cottages have their own entrances and terraces. Are you looking for peace and want to forget everyday life? Then you are welcome to us. We offer two comfortable cottages in a very quiet location. In addition to the good facilities of the houses you will find an idyllic property with a pond and calming stream. Everything right on the edge of a landscape conservation area. Biking, hiking, Nordic walking ... Everything is possible. Willersdorf is a district of Frankenberg (Eder) in Waldeck-Frankenberg in Hesse. The place is located in the area known Ederbergland, on the edge of the Burgwald. The highest peak of the Burgwald Knebelsrod (443 m) is just 15 minutes away (on foot). Willersdorf was first mentioned in the year 1294th The village itself is between 357 to 390 m high and has about 650 inhabitants. The holiday region Ederbergland in the middle of Germany, on the edge of the Sauerland region, adjacent to the National Park Kellerwald-Edersee. There are numerous possibilities for excursions in the surrounding area. Featured old towns, the Eder, the university town of Marburg, the spa town of Bad Wildungen, the delightful Edersee and the castle Waldeck, etc. Winter sports fans can quickly reach Winterberg or Willingen from the Ederbergland with its numerous winter sports activities. Linen (once per person, available 6 EUR). Final cleaning for pet (additional) (once per object, costs EUR 20). Towels (one per person, available 4 EUR). Pets (per property per day, included 5 EUR). Internet (per object and day, included in the price 0 EUR). Parking (per object and day, included in the price 0 EUR). Additional charge for final cleaning for persons 6 and 7 (once per object, costs of 20 EUR).